It’s been a busy year already planning for the year ahead. While 2013 saw a rotation in the stock market from the less risky sectors like utilities and into growth sectors like technology, with the likelihood of slow economic growth ahead I expect 2014 to reverse that trend. Here is the link to where I discuss in more detail my outlook for the year ahead. The biggest worry heading into a New Year is that with the market at record highs, it certainly must be overvalued and due a correction. While a correction might actually be welcome (the pause the refreshes), worrying about whether the market is too high is quite a relief compared to recent worries of the past – financial meltdown, Europe/Euro implosion, China hard landing, U.S. recession/depression… So while anything could happen in the short run, let’s look into the crystal ball and see what we can see. 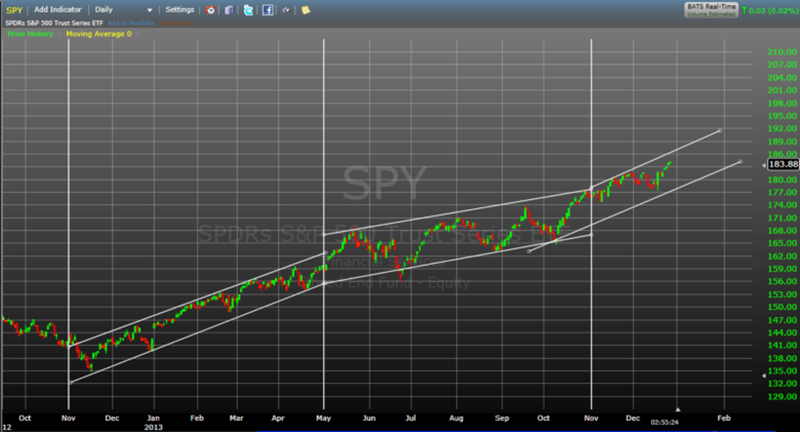 Below is a Graph of SPY, the SPDR S&P 500 Index ETF since October of 2012. Highlighted by the vertical lines are the three recent time frames marked by our seasonal strategy – better known as the Halloween Effect. In short, global market history shows that most of a stock markets’ gains come from the period of November first ( the day after Halloween) through the end of April (when you will hear the phrase “Sell in May and go Away…”). While 2013 proved to be a good year to be in the market – for the entire year, you can see a marked difference in market performance. While the market went up during the entire period, between the second and third vertical lines, you can also see that it did so with more volatility than the period prior, and so far in the period after. Technically the market is in a solid uptrend, and until it breaks out of this trend by going up through the top line of resistance, or down through the bottom line of support, we are in a bull market and investors should be taking advantage of it. Looking at the bigger picture, Figure 2 looks at SPY using monthly returns since 1998. 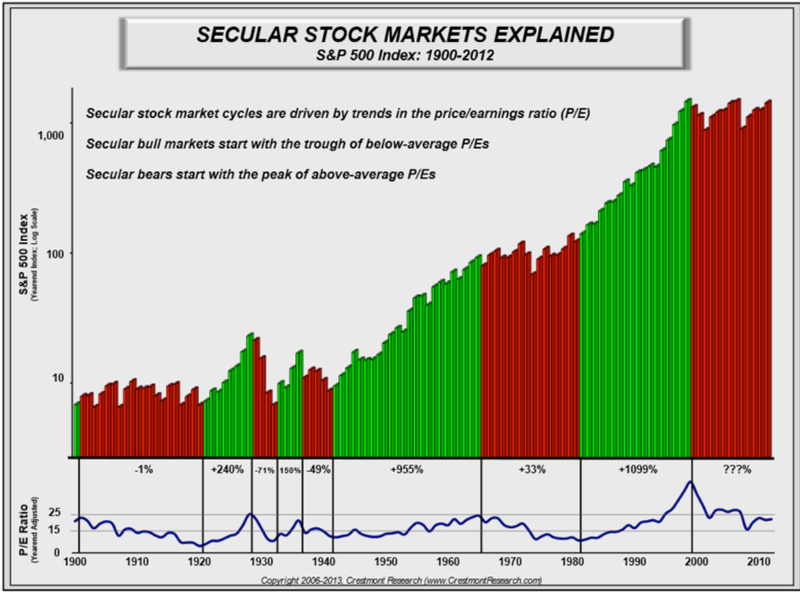 One of the debates about the market is whether we are still in a secular bear market that started in 2000. A secular bear is defined as a market that has reached a peak, declined and failed to rise above and stay above that peak. So in 2007 we breached the 2000 peak, but failed to stay above it. Today we are working on nine months of being above the 2000 and 2007 peaks. The question is can we stay there? Bottom line – it will take a 17% decline to bring us down to the 2000 high. Given that we are in a seasonally strong period, it’s likely that it will take a full blown official correction of 20% or more to breach the 2000 high. While 20% corrections aren’t uncommon, more than that is, so barring a macro event as of yet unknown origin (the proverbial Black Swan) I believe we have exited the 2000 – 2013 secular bear and have entered into a new secular bull market. Below in Figure 3 is the classic secular Bull/Bear Markets graph from Crestmont Research (crestmontresearch.com/docs/Stock-Secular-Explained.pdf). Quite simply in a secular bull market, the market is supposed to record news highs! Note: the folks at Crestmont believe we are still in the middle of a secular bear market. The common mistake our clients make is to think that price alone has any relevancy to whether the market, or a security is priced too high, or too low for that matter. While maybe not the best, the better and most common metric is Price to Earnings Ratio. While there are many variations on the “proper” P/E to use, I like to look at the earnings for the most recent quarter, annualize and use the current market price. Based on information from zacks.com third quarter earnings for 2013 should beat year ago earnings by about 4.9%, putting third quarter earnings at about $22.25 per share. Annualized that would be $89.00 a share. Based on the S&P 500 at 1842 we have a current P/E of 20.7. The good news is that the third quarter solidly beat expectations of only 1.10% earnings growth. Bad news is that earnings estimates for fourth quarter are coming down. Based on current estimates of 6.8% YoY growth, actual earnings will decline from third to fourth quarter 2013 – meaning P/E ratio goes up, not down. This market really is getting expensive. Not to the eminent crash level, but to a level where it is hard to see huge market gains in 2014. Earnings absolutely have to catch up to current market prices and keep the current P/E at or under 20. Secular bear markets historically start with P/E’s in the mid 20’s so we could see a solid 25% gain from current market levels – and then seriously talk about bubble territory. 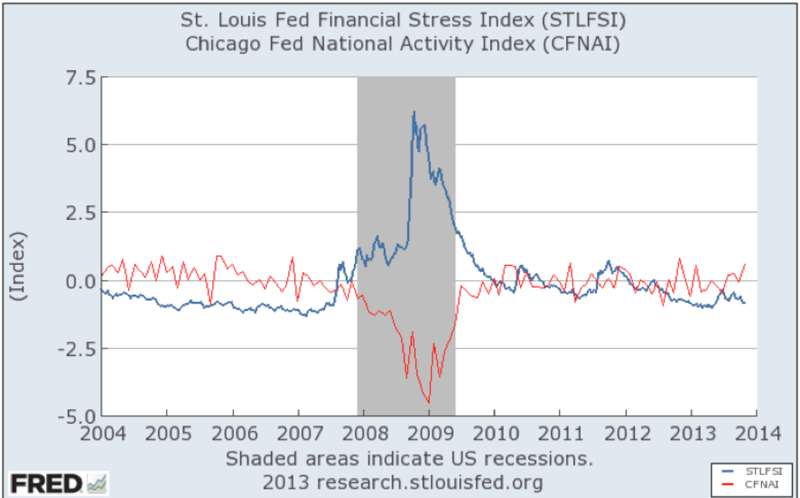 One of the best data series for predicting economic conditions is the St. Louis Financial Stress Index and the Chicago Fed National Activity Index. Below in figure 4 you can see that financial stress is negative and heading lower (good) and the activity index is positive and moving higher (good). So not only is economic activity healthy and improving, the financial conditions exist to bolster continued improvement. While many interpret this as a warning sign with the Fed announcing a tapering of QE III, I see it as a positive. While the U.S. Fed has announced a very modest reduction to QE III, new hire Janet Yellen does not have the history to indicate she will be hesitant to reapply the stimulus at the first sign of economic softness. Plus, the Fed has made a point to reiterate ZIRP policy, well into 2015. Remember that pre-crisis interest rate policy was monetary policy. So we are simply transitioning from extraordinary monetary policy to “normal’ monetary policy. In other words the Fed remains accommodative. And that’s not just in the U.S. The world is awash in cash, and continuing to get more. The financial crisis led to six years of belt tightening by consumers and businesses, and maybe, just maybe the world is ready to spend again. 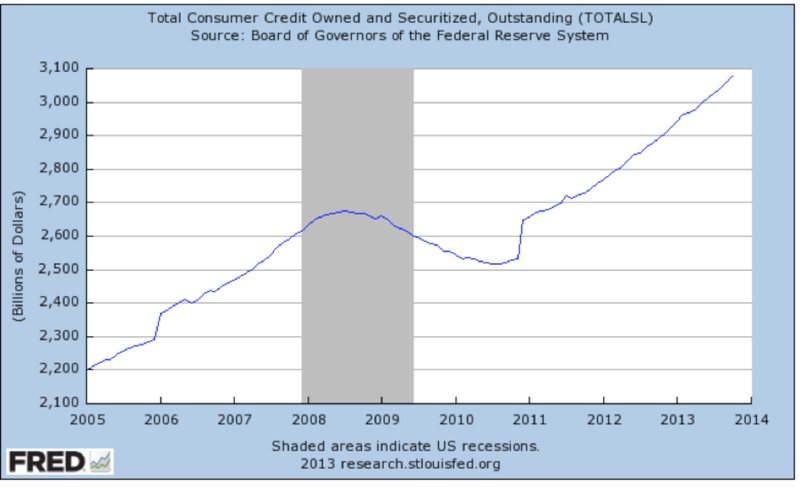 And just to confirm, Figure 7 shows total outstanding consumer credit – actually looks like we stopped pausing back in 2011. One of the hardest things about market predictions is that there is really only a very loose correlation between economic growth and the stock market in the short run. In 2013 we had very anemic economic growth but an extremely strong stock market. 2014 is looking to be another year of steady if not spectacular economic growth. 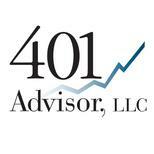 However the stock market looks to face two strong headwinds. First is the current valuation. To break a 20 P/E ratio there needs to be some feeling of “irrational exuberance” to ignore valuations and move higher. In 2013 the market was driven by some of the big technology names and IPO’s. But I don’t see much room for a sector rotation to undervalued companies too drive the averages in 2014. I did a simple stock screen on finviz.com. The only search criteria I used was NYSE listed stocks (3311 total) and screened for P/E under 15 (long term historic average) and positive earnings expectations for 2014 – not exactly a big hurdle. The results were a list of only 263 stocks. The market is broadly expensive. This is not the time to fight the technicals which are very strong. But I would be very wary as we move forward. Any hiccup to the goldilocks scenario that is being priced into the market could lead to a very quick 20% correction. But there aren’t any obvious reasons to return to the secular bear levels (below 2000 highs) and stay there for any length of time. The world is simply awash with cash, and nobody is likely to do much monetary tightening for at least another year. Great report – thanks Bill !